since 1983, and we are dedicated to helping families through the process of selecting a meaningful memorial headstone for their loved ones. We offer not only quality monuments made from the finest materials, but more importantly, we take the time to provide personal, caring service without any pressure. It is our goal to help you choose and personalize a monument that fits your needs as well as your budget. No job is too big, or too small for us. Because we design, carve and letter our monuments right on our premises, we are able to provide the highest levels of quality and service at the most reasonable price. Before making your final decision, let us show you what we can do for you. All consultations and estimates are given free and without obligation. Thank you for considering Spence Monument Co.
Spence Monument Company guarantees to repair or replace your monument should it ever crack or disintegrate from exposure to the elements or lose its natural color and finish. Each monument is guaranteed to be delivered to your exact specifications as outlined in writing in your contract and layout. We accept Visa, Mastercard, American Express & Discover as well as personal checks. If you prefer, you may pay for your monument in monthly installments, however we cannot process your order until the account is paid. Please ask us for details. 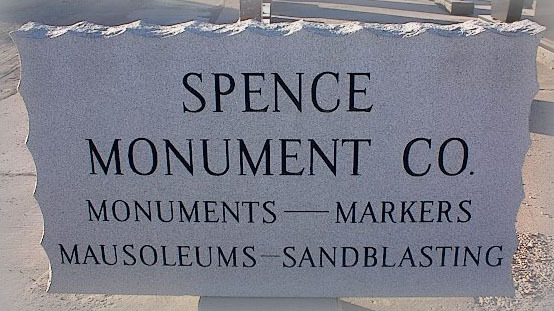 ALL MONUMENTS REMAIN THE PROPERTY OF SPENCE MONUMENT COMPANY UNTIL PAID IN FULL. MONUMENTS NOT PAID IN FULL ARE SUBJECT TO REMOVAL FROM THE CEMETERY. THERE WILL BE AN ADDITIONAL CHARGE TO RESET THE MONUMENT. We hope this information will be helpful to you as you begin the process of choosing a monument for your loved one. Please navigate the links to the right to browse through our products and services as well as access related useful information.